Decision Online Poker: Which Presidential Hopeful is Best for the Game? 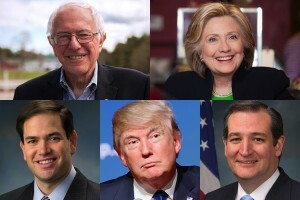 Home » Post Archive » Decision Online Poker: Which Presidential Hopeful is Best for the Game? Online poker is approaching a critical period in the United States, with many believing the next 12 months could determine whether the game will be legalized or shelved away on the black market for eternity. The iPoker trepidations parallel an overall sentiment among both Republican and Democratic leaders that the next four years will be an urgently important time in America. It seems every presidential cycle candidates hype the importance of the outcome by stressing the country’s dire condition, but in 2016 it appears to be ringing truer in the minds of US voters. Whoever replaces President Barack Obama in the White House and become the 45th president of the United States must face the continued war on terrorism, address health care laws, a stagnate economy, and a host of other pressing concerns. Though New Jersey Governor Chris Christie (R) downplayed the importance of regulating online gambling and daily fantasy sports during one Republican debate, the truth of the matter is that it’s a potential multibillion-dollar industry worthy of a nationwide legislative discussion. Unless you’re an Iowan, you still have time to decide which party and candidate receives your backing. That’s good news for online poker players who still have little to go on by way of voting records from the frontrunners. Following the withdrawal of former Maryland Governor Martin O’Malley, the Democratic ticket is now a heads-up tournament between Hillary Clinton and Vermont Senator Bernie Sanders. Sanders, who at 74 is currently the 14th-oldest senator, is yet the junior senator in Vermont as Patrick Leahy (D) is one year his senior. Sanders is a self-described democratic socialist who follows the Nordic ideals of progressive government. He’s long been his own man, and in 2006 that was evident when the Unlawful Internet Gambling Enforcement Act (UIGEA) came up for vote when he was still serving in the US House of Representatives. UIGEA effectively banned all forms of online gambling by preventing businesses from accepting payments through the Internet that related to betting or wagering. Though the majority of Democratic representatives opposed the bill, Sanders voted in favor of putting online poker into prohibition. Aside from serving as Secretary of State and of course First Lady, Clinton also spent eight years in Congress as senator from New York. Like Sanders, Clinton voted in favor of UIGEA when the bill reached the Senate, though the legislation had bipartisan support by that time with a final vote of 98 in favor, zero opposed, and two not voting. Clinton later called for an investigation into the merits of regulating online gambling. The GOP 2016 ticket is thought to be down to Texas Senator Ted Cruz, billionaire Donald Trump, and Florida Senator Marco Rubio. The problem for online poker backers is that there’s little to run on in relation to where those three stand in relation to Internet gambling. Due to Trump’s long history in gambling, many believe he wouldn’t take steps to block casinos online, though there’s no evidence to necessarily support those claims. Trump also met with follow casino tycoon Sheldon Adelson in December. Adelson is the most active anti-online gaming supporter in the US. Since Cruz and Rubio weren’t serving in Congress during UIGEA’s passage, they have no federal votes on gaming-related legislation. That said, Cruz’s deep Southern Baptist faith wouldn’t likely favor any form of casino expansion. Rubio has also catered to Adelson and is rumored to be the billionaire’s preferred candidate. When it comes to online poker, the candidates are largely maintaining their poker faces and avoiding the issue. Right now, it’s difficult to conclusively say which candidate is best for the health of online poker. But come your state’s caucus or primary, you’ll need to move all-in with your candidate of choice.